An Iranian woman prays at St. Joseph's Cathedral in Tehran, Iran, a country where Christians and other religious groups have faced persecution. As Christians all over the world celebrate Easter weekend, dozens of fellow faithful are growing weary — waiting for the virtual gates of America's refugee services to reopen. 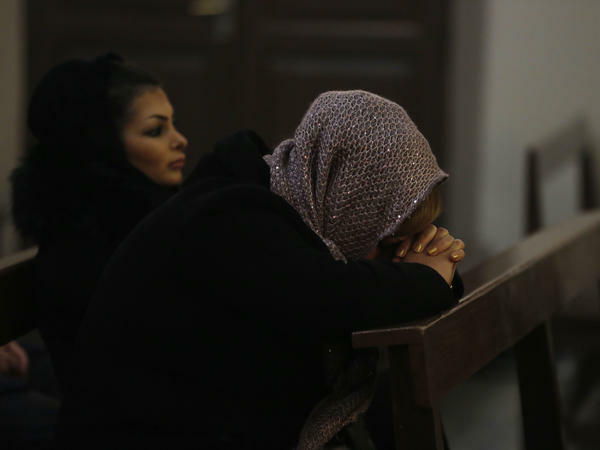 More than 100 Iranian Christians and members of other religions have been stranded in Austria for over a year, after the U.S. program that welcomes religious minorities from Iran has all but shut its door under President Trump, refugee advocates say. Eighty Iranians who traveled to Vienna expecting to be resettled in the United States have already been denied asylum in America. Others are awaiting final U.S. approval. The rejection puts the applicants at risk, has angered members of Congress from both parties and devastated U.S. family sponsors. "I get mad and start crying and my body starts shaking," says one of the relatives on a Skype call from Los Gatos, Calif. She did not want to use her name because she fears for the safety of her sister now stranded in Vienna and in danger of being sent back to Iran. The threat looms after the United States denied her sister's asylum request and the Austrian transit visa is about to run out. "I need my sister, I want her beside me," the family member wails, tears streaming down her face, as she sits in the offices of Jewish Family Services of Silicon Valley. The nonprofit has resettled many Iranian refugees over the years, including this woman and part of her family who came from Iran 15 years ago. They were shocked when this final member of the family was rejected. Previously, the U.S. program that takes in members of repressed religious minorities from Iran and other countries with family in the United States had an almost 100 percent acceptance rate, according to HIAS, the nonprofit agency hired to facilitate the resettlements. But now, refugee advocates say, the U.S. is denying their asylum claims, risking their deportation to Iran where advocates and U.S. legislators say they could face imprisonment or other persecution. The Trump administration has dramatically curbed refugee resettlement, lambasted immigrant family reunification programs and barred many citizens from Muslim-majority countries, including Iran, from traveling to the United States, citing national security concerns. At the same time, the administration has pledged to favor Christian refugees in the Middle East. "The egregious part is twofold," says Betsy Fisher, project director for the International Refugee Assistance Project. "It's a violation of the administration's stated policy that it is going to focus on protecting religious minorities." The second part, she adds, is a humanitarian crisis, "completely of the U.S.'s making." That crisis is now playing out in Austria's capital. The Iranian migrants are marooned there after quitting jobs, selling homes and possessions and cutting ties with their home country, believing they were bound for a new life in the United States. Now, more than a year later, many are destitute and their future is uncertain. "It keeps me and our staff awake at night because there is no answer right now," says Mindy Berkowitz, who heads Jewish Family Services of Silicon Valley. "They can't go back to Iran and I don't know if they can stay in Vienna. It's so hard," she says. The government's specialized refugee program worked quietly for over a decade settling more than 30,000 Iranians in the U.S. The program follows rules set by Congress under the Lautenberg Amendment, which was originally passed for Jews escaping the Soviet Union. In 2004, Congress expanded the program for persecuted religious minorities from Iran — mostly Jews and Christians, but also Mandeans, Zoroastrians and Baha'is. Under an agreement with Austria, the U.S. State Department selects applicants who travel to Vienna for final security checks that usually take weeks or a few months. There have been no new candidates accepted since January 2017, despite more than 4,000 applicants currently waiting in Iran, says Fisher of the International Refugee Assistance Program. "The U.S. government hasn't officially pulled the plug on the program, but I think it's fair to say that it's another example of the Trump administration de facto dismantling a program that was mandated by Congress," she says. Some Congress members have been pushing back. Massachusetts Democrat Jim McGovern and Illinois Republican Randy Hultgren sent a protest letter in February to Vice President Pence, accusing the administration of "thwarting the purpose of the law." "Under no circumstance should those seeking refugee status be repatriated to Iran, where they could be subjected to arrest and torture," the bipartisan congressional human rights commission said. The Congress members also demanded the program resume for Iranian religious minorities waiting in Iran and urged Homeland Security and the State Department to "take steps to prioritize and expedite any relevant security checks." But, so far, there's been no official answer from the Trump administration, according to a congressional staffer speaking on condition of anonymity because he was not authorized to talk to media about the issue. "It seems they are dragging their feet." Berkowitz of Jewish Family Services says she has been fielding calls from frantic relatives. Three out of those stranded in Vienna are related to immigrant families in and around Silicon Valley. Berkowitz says the uncertainty for them is excruciating. "When you have somebody who you love and you don't know what is going to happen to them and you are so worried for their safety," she says. The State Department would not comment on the specific reason the asylum claims were denied in an email exchange with NPR. A State Department spokeswoman wrote that "changes to the program resulted in a greater number of denials." Without the program, writer Roya Hakakian may have never resettled to the U.S. like she did in Connecticut over 30 years ago. She was a teenager when she and her family arrived in Vienna for the final security checks. "I came with nothing from a hostile country and here I am, somebody who went to college, published books, made a life," Hakakian says. Her welcome transformed her into a patriotic American, she says, a defender of what she insists are the country's core values. "I think if the American light goes out there is very little hope for everyone else under persecution in other parts of the world," she says. Hakakian is tracking the Iranians stranded in Austria. "If they are turned back I personally fear for their future," she says. "There is no telling what could happen to them."